Bowie packs 3/14 info session on solar co-op! 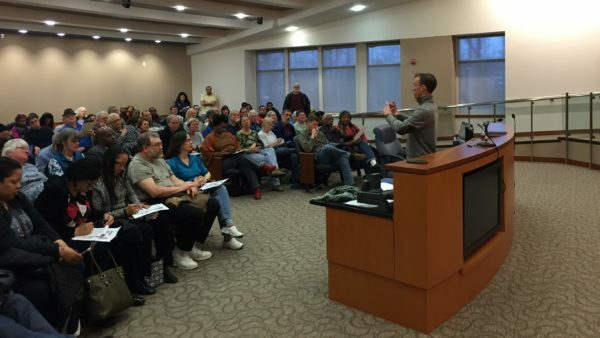 More than 90 people turned out on Saturday the 14th at Bowie City Hall despite the rain to hear about how their neighbors formed a solar co-op and are going solar together. The group was so big the meeting had to be re-located to the City Council chambers to accommodate the crowd. Representatives from Sustainable Energy Systems (SES) were also in attendance to answer questions from homeowners. The group’s Selection Committee selected SES from eight competitive bids to install solar for the group at a deeply discounted price. Maryland Sun Program Director, Corey Ramsden and Emily Stiever, Chief of Staff of Maryland Sun’s parent organization, Community Power Network, led the information session, answering questions from residents on solar technology, the solar co-op process and the economics of solar in Maryland. Thanks to everyone out there who promoted the meeting to friends, family, and neighbors throughout Bowie! Residents of Bowie and surrounding areas can sign up to join the group through April 30th.